Fingers let us touch, grasp, and interact with our environment, and they are easily injured. In fact, they are the most frequently injured part of the hand. Injuries may range from simple bruises or contusions to broken bones. In addition, injury to or dislocation of the knuckles, which are the joints formed by the bones of the fingers, are common with trauma to the hand. Broken fingers rarely go unnoticed. Frequently, you have immediate pain after trauma and sometimes a deformed finger either at a joint (commonly a dislocation) or through the bone as a fracture. If there is no deformity, a person will typically feel a sharp pain at the injury site. You may not always be sure the finger is broken and try to bend it. If it's broken, doing so will usually be painful. Don't be fooled if you can still move the finger. In some cases, there may still be some range of motion and only dull pain. Fractures are common, and how bad they hurt typically depends on their stability. Usually within the next 5-10 minutes, you will notice swelling and redness. As the swelling continues, the finger will become stiff and difficult to move. Swelling may also spread to the adjacent fingers. If the fracture is severe, you may see bruising. And if the swelling gets too massive, the finger may become numb as nerves in the fingers are compressed. The best place to find medical treatment for a broken finger is an urgent care facility or a hospital's emergency department. These facilities are dedicated to the care of such injuries and have the needed equipment and supplies for X-ray evaluation and splinting if needed. Temporary splinting, ice, and pain control are helpful supportive treatments. Make a splint to immobilize your finger even if that means putting a popsicle stick or pen next to it and wrapping something around the stick and your finger. A doctor will need an X-ray to evaluate the broken finger bones. Treatment depends on the type of fracture and the individual bone or bones in the finger that are injured. The emergency doctor or an orthopedic surgeon will assess the stability of the broken finger. If the fracture is stable, treatment may be as simple as splinting 1 finger to another by taping them together. The splint will be left in place for about 4 weeks followed by an additional 2 weeks with no strenuous exercise. If the fracture is unstable, the injured finger will need to be immobilized. Immobilization can be done in several different ways. The simplest is to apply a splint after aligning the fracture fragments. This usually does not maintain enough stability, so a surgical procedure may be needed. Surgical options range from pinning the bones with small wires to open procedures using plates and screws to keep the bones in place. The surgeon will discuss the options with you and explain which procedure might be considered best and why. You will most likely leave the hospital with some type of splint or dressing. It is very important not to disturb your splint. It keeps the fractured finger in the correct position for healing. You'll also need to keep the dressing clean, dry, and elevated in order to decrease the swelling. Activity may aggravate your injury and cause increased pain, so it is best not to use the injured hand until your follow-up appointment with your orthopedic surgeon. Your surgeon or doctor may want to see you about one week after your injury for another X-ray to evaluate the position of the fracture fragments. It is extremely important to keep this appointment. If the finger is not aligned correctly, it may affect the healing of your finger and cause permanent disability. In rare cases after a surgical procedure, an infection may occur. The signs of infection are fever, increasing redness, swelling, severe pain in the finger, discharge of pus, or a foul smell from the surgery site. If these symptoms occur, go to the emergency department immediately to be evaluated. The best prevention for finger fractures is safety. Most fingers are broken by machines or as a result of sporting injuries. Remember to always use safety equipment when doing activities that may injure your hands. Despite all efforts and precautions, injuries do occur and should be evaluated as soon possible. After treatment and 4 to 6 weeks of healing, the prognosis for the bones coming together and healing properly is excellent. The most common problem encountered is joint stiffness. Immobilizing the fingers can result in the capsule and surrounding tissue forming a scar around the joint. It becomes a race to heal the bone before the joint becomes too stiff and a decrease in motion occurs. Many people may require physical therapy (preferably with a hand therapist) for range of motion exercises. If you are one of them, it is important for you to continue the therapy and exercises because range of motion can continue to improve for up to a year after the injury and treatment. Media file 1: Broken finger. 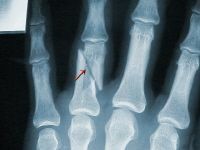 A severe fracture of the proximal phalanx of the small finger. This bone is broken in many small fragments and very unstable. This injury occurred in an automobile accident but also can be seen in any traumatic incident. Because it is unstable, surgery was needed. In this type of injury, the surgeon may use either pins or plates and screws for repair. The pins would stay in for about 4-6 weeks, and plates and screws would be removed only if bothersome. Media file 2: Broken finger. 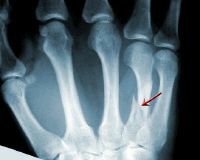 This x-ray shows an oblique (diagonal) fracture through the proximal phalanx of the ring finger. Notice how the fracture tends to slip or shorten (arrow). Not only does this fracture shorten, but rotational deformities are also seen. Usually it is not stable enough for just taping to adjoining fingers, and surgery may be needed. Media file 3: Broken finger. This x-ray was taken in the operating room after pinning of a fracture similar to the one in picture 2. The x-ray shows how the multiple small pins hold the fracture in anatomic alignment, and the shortening is gone. This will maintain stability until the fracture is healed. The pins may be removed in 4-6 weeks. Media file 4: Broken finger. A typical fracture at the end of the small finger metacarpal is shown in this x-ray. The fragment is most always flexed toward the palm as seen in this x-ray. Most typically this fracture is caused by a closed fist striking an object. This commonly is called a boxer's (or brawler's) fracture. Treatment of this fracture usually is conservative casting. Don't be alarmed by the angulation of the bone. It is usually only cosmetic, and hand function should be normal after the bone heals. Media file 5: Broken finger. This x-ray illustrates a common fracture of the distal phalanx. It is an injury where the distal phalanx is forced toward the palm and resisted by the pull of the extensor tendon. This is very common in sporting events in which a ball strikes the end of the finger (often called mallet finger). These injuries are either bony (as seen) or involve ligaments. Treatment is splinting or surgical pinning of the distal phalanx. This injury may take a long time to heal and must be watched closely. Despite every effort to heal, a residual lag may continue after treatment. This usually is cosmetic only and does not affect grip strength. Media file 6: Broken finger. This is an x-ray of an oblique (diagonal) fracture of a metacarpal. These injuries occur from a twisting or crush injury to the hand. They are common to machining and workplace injuries as well as direct trauma. There are many different muscles and tendons that may accentuate this fracture causing shortening or angulation toward the palm. Treatment may consist of either casting with close observation or a surgical procedure for stability of the fracture. This would depend on the severity of the fracture seen on the x-ray.